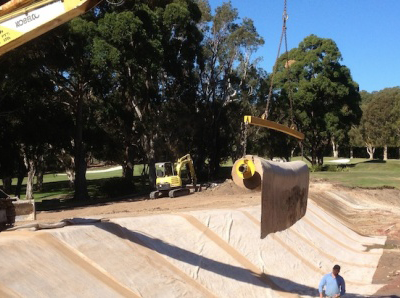 Bentofix® GCL with nonwoven cover geotextile and woven carrier geotextile. 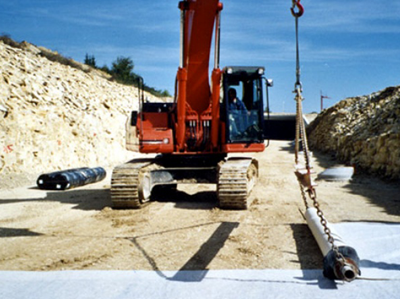 An additional surface polyethylene (PE) coating is applied in a liquid state and then allowed to solidify on the carrier geotextile. The additional bonding of a PE coating to the needle-punched, fibre reinforcement is permanently locked and increases the pull-out resistance as well as the internal shear strength. The mass coating is 200gsm (0.2mm thick) minimum for the smooth coating and exceeds the GRI-GCL3 (USA) minimum specification requirements for coated GCLs. Also features self-sealing side overlaps. The project had been discussed for more than 40 years before the three-laned road (width 11.50 m) was finally constructed in 2002.